Just because you might have some old fishing rods does not automatically make them valuable. Value is determined by craftsmanship, quality, rarity, supply and demand. If those things don't factor into those old fishing poles,... well, then they are just junk in the eyes of a collector. If a pole is at least 40 years old, then it's considered to be a vintage fishing rod. 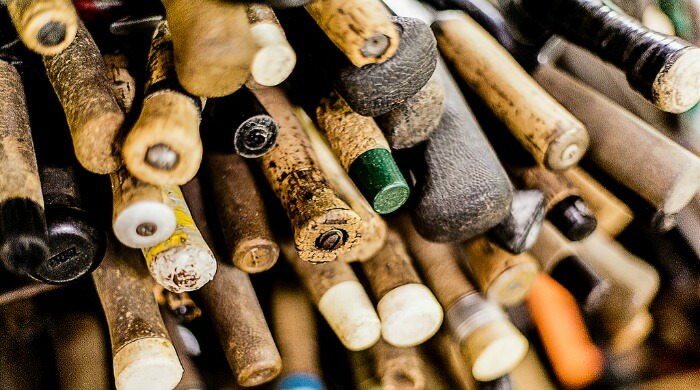 Find the right rod built by the right person or manufacturer and you could be in luck. If a pole is to be at least 100 years old, then it's considered to be an antique fishing rod. Come across an old rod from this era and you may have hit the jack pot. If you're like me, you probably have some older fishing rods that you aren't using anymore for one reason or another. Missing tips, broken guides, cracked handles, no backbone, too heavy, or whatever else. Here's an idea. Why not donate them. There are people who volunteer their time refurbishing old fishing poles and tackle. Then they provide the newly restored gear to the youth and to those that are less fortunate. There's a great feeling about bringing old fishing equipment back to life and getting our younger generations involved in this great sport of freshwater fishing. Don't get it twisted. I'm not saying to start handing out your high valued collectible rods like they're candy on Halloween. Just get rid of some of that clutter that you know you'll never mess with anyway. Your spouse will be happy, you'll feel good about yourself for helping others, and the kids will be excited. The obvious reason is that old rods are usually cheaper than new ones of the same make and model. The main difference is that they have been used, but still perform just as well. Another reason to search for old rods is in hopes of finding vintage and antique collectibles. Old, but valuable rods can go overlooked by non experienced people. Garage sells and estate sells are one of the best places to stumble upon old fishing tackle that could be worth a bundle of money. Another great place to shop is Ebay. Good luck!